Allergy Advice: Contains Wheat, Shrimp, Soybean. Manufactured in a facility that also processes egg, milk, wheat, peanut, crab. Ingredients: Wheat Flour, Palm Oil, Shrimp, Tapioca Starch, Sugar, Rice Bran Oil, Shrimp Seasoning (Dried Shrimp Powder (Shrimp, Dextrin, Salt, Disodium Guanylate, Disodium Inosinate, Alanine, Xanthan Gum), Salt, Maltodextrin), Seasoned Shrimp Oil (Soybean Oil, Dried Shrimp), Kelp Extract. 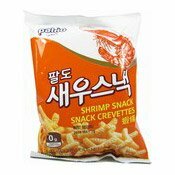 Simply enter your details below and we will send you an e-mail when “Shrimp Snacks (Prawn Crackers Sticks) (蝦條)” is back in stock!